Days of mid 20 degrees Celsius in Winter, snow in Spring, dust storms that reduced visibility to less than a metre, freak storms the likes which haven’t been seen by locals before and finally an earthquake which shook the whole house. We’ve experienced it all so far this year. February was warm – too warm – and the Spring like weather that we experienced brought out all the wildflowers and blossoms early. Not that I was complaining as it was lovely to soak up the sun and get out and about and enjoy the sights and smells of the earth awakening from her winter’s sleep. Then it got cold again. 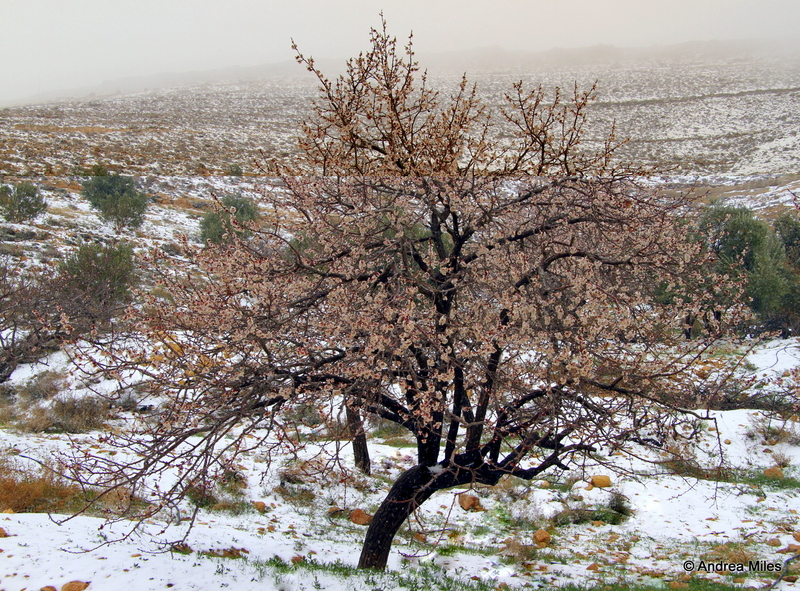 So cold that it snowed on the 14th of March, in Jordan, in the Middle East! Not just a little bit of snow, but enough to blanket the whole landscape white and for it to stay on the ground for 2 days. It did make for some pretty photos with the wildflowers all out and dusted in snow. The first dusting of snow on the morning of the 14th. It continued to snow for the rest of the day. The poor almond blossoms didn’t like the cold and a reduced harvest was the result. 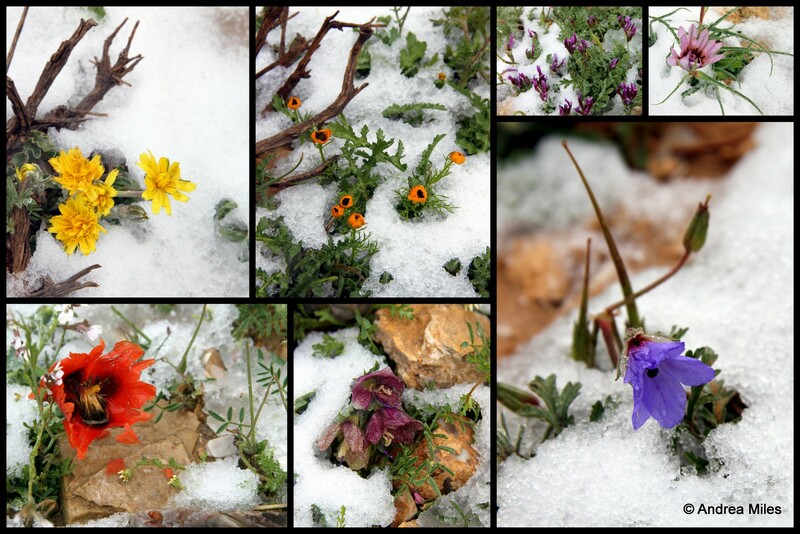 The colourful spring wildflowers bravely poking their heads through a carpet of snow. April and the Khamsein winds blew strong bringing the dust from the desert to our doorsteps. This is a photo of the dust storm on the 20th April from inside a house over in Ma’an, a village that is only 15 minutes away from us. Bet these people were wishing that they had closed the window! Photo credit for the dust storm inside the house at Ma’an to Tariq Nassim Tannous via the Live in Aqaba facebook page. The visibility wasn’t reduced this badly in Wadi Musa, but we were still left with half the sand from the desert turning the paving around the house into a beach. This was the accumulated sand, from about a week of dust storms combined with ongoing roadworks, around our house. This corner outside the house traps the wind currents, and therefore the sand and dust, perfectly. The week of May the 5th and the storm clouds brewed on the horizon. Monday to Wednesday the clouds would build on the horizon and only to roll off into the distance without any real action. The evening of May 7th and finally the rain that had been threatening all week began. Overnight it poured and we had about 4-5 inches of rain but little did we know that the real drama was yet to come. May 8th and we awoke to an overcast and stormy morning. The bottom corner of our garden was flooded under 1/2 metre of water. Preparing Alia’s breakfast that morning, I was very distracted by the storm front that was moving in from the north west. It was dark, menacing, and combined with the early morning light and sun reflecting off the soaked mountains, it was picture perfect. Poor Alia had to wait for breakfast as I hurried out to the balcony to capture the approaching clouds. This storm front dumped another couple of inches of rain, on the already sodden earth, not long after I took these photos. And yet the best was still to come. The clouds cleared, brilliant blue skies appeared, and the sun shone brightly at around 10am. The town looking so fresh and clean after it’s soaking from the night before and the morning storms. There was no indication of what was about to come from this photo. For the next few of hours we were basking in glorious sunlight and all over town people could be seen on the roofs of their houses sweeping away the rainwater – me included! It seemed like the forecast for rain and thunderstorms to continue all day was wrong. Around 3pm the dark clouds started to build on the horizon again and maybe that weather forecast hadn’t been so wrong afterall. 4pm and I headed outside, armed with the camera, again as the colours and the intensity of the clouds forming was quite surreal. There was an incredible depth to the clouds and a hue of sea green giving it an out of this world feel. It should have been enough of a ominous warming of what was only minutes away. The storm was incredible and like nothing I had ever experienced before. It moved at a frightening pace (times included on the photos) across the town unleashing all it’s fury with hail the size of golf balls. It dumped another 4 inches of rain and hail within 4-5 minutes the result being mudslides and flash floods all through the valley. Homes were inundated with mud and water, roads washed out and completely inaccessible. We escaped the worst of it, up on our hill, as the centre of the storm passed directly over the middle of town and we only got the edge which was bad enough. A friend’s garden was covered in 3 inches of hail destroying it, and then the mudslide from the mountain behind her house finished it off. The site of Petra was closed to tourists as it was flooded – a torrent of water flowing through the Siq. Click on the thumbnails to see larger images of the storm, the description and time each picture was taken. There was an eerie green tinge to the cloud. Little did we know that they were saturated to the max and getting ready to unload their full fury. The sky turned black as the storm front swallowed up the town. It was like watching something from a movie with how quickly the storm front was moving. 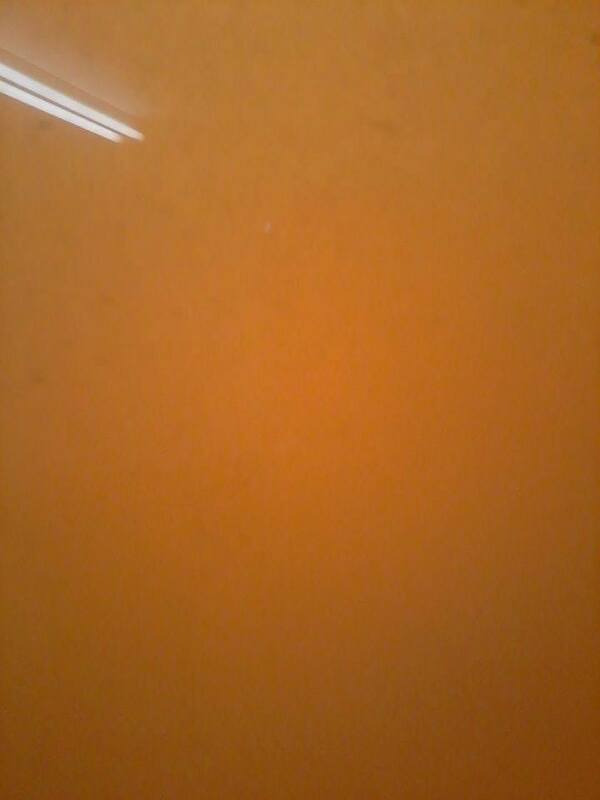 Day has turned to night. The clouds were so black. The first drops of rain were just starting to hit our house as the storm front was chasing away the last of the daylight over town. Getting wet now and then the hail started. Time to move indoors. This was the hail that fell within 2 minutes. It looked like it had snowed there was that much hail. The hail at our house was the up to the size of my thumb. In other parts of town it was up to the size of golf balls and did incredible damage. The noise from this hail hitting the windows was so loud that I thought that the windows would break. The storm front as passed leaving behind it a trail of destruction – flooding, mudslides, hail damage. The last of the black clouds passing over town. Water rushing down the mountain and draining through the new concrete retaining wall near our house. The house down the valley from this was completely swamped with mud and water. Just outside our side door. 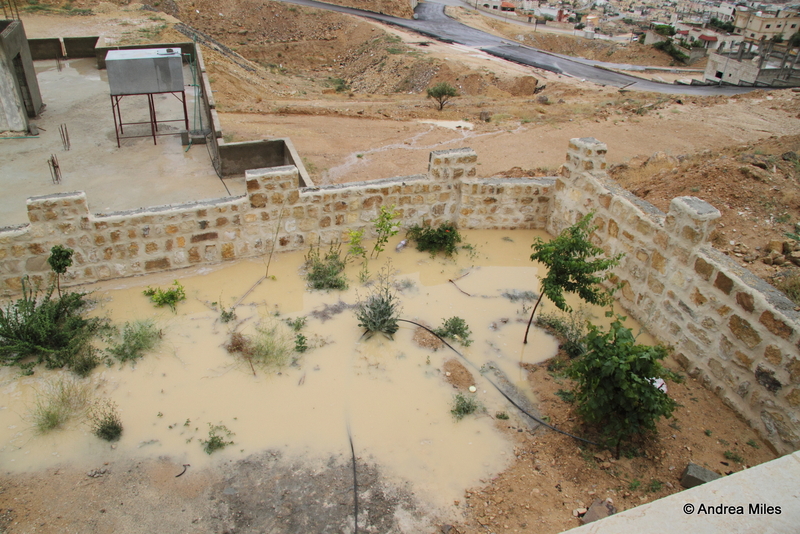 Atef’s brother had to run around with a hoe and quickly dig some trenches to ensure that the water continued on it’s way down the valley and didn’t come near our house. As if we hadn’t experienced enough weird and wild weather, on the 24th May the ground rumbled and shook. 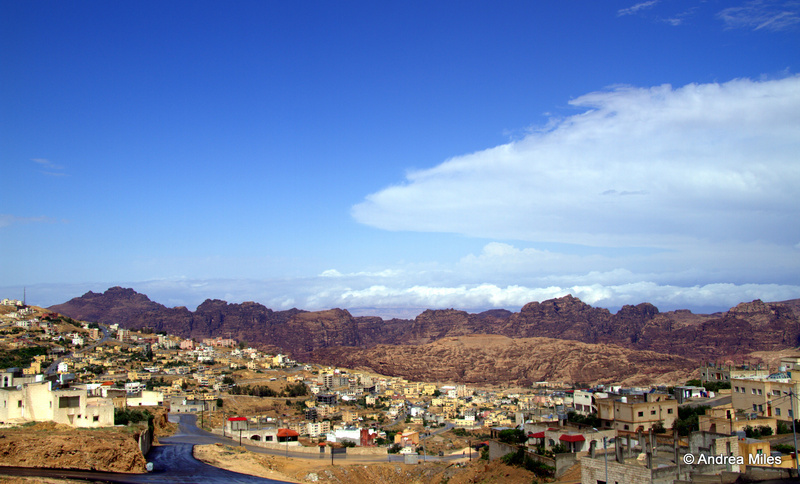 At 10:30 that morning an earthquake of magnitude 4.2, with an epicentre only 28kms northwest of the town, was felt as far away as Aqaba (about 120kms from us). It was my first time to experience an earthquake. The rumbling sound, like a fully loaded freight train, came up through the earth and through the foundations of the house setting it all shaking and rattling. The tremor seemed to passed up through the house and right through my body leaving my heart trembling as well. Not an experience that I enjoyed. We are situated on the Rift Valley (Wadi Araba) and according to the locals and data on earthquakes in the region, well overdue for a big earthquake. Let’s hope that history is wrong in this case and the ground stays still for some time yet. That’s enough crazy weather for this year! Great weather story MEM. Good luck with the clean up. Thanks MB. We escaped the worst of it unlike others so were lucky. This certainly has been the year for crazy weather. We are now battling our way through a hotter than average summer. We didn’t have any damage to our house, apart from a water soaked garden. Everyone in Atef’s family lives on the same side of town as us so not in the direct path of the centre of the storm so very lucky. Wow, I didn’t realise Jordan gets snow! Love the dramatic storm shots, it must have been spectacular to watch! Excellent post and astonishing pictures! I’ve shared this post at Google+, Twitter, and my Facebook page. I do enjoy your posts so much! thank you andrea, your posts bring me back to petra !!! Yes the first half of this year had crazy and strange weather in Wadi Musa, not seen before especially in May and the golf size hail. I was in the office with my colleagues that moment and we could not move from there, and even no one can reach us until the storm ended. Thank you for sharing the photos and of course I will share as well at our social channels!